Ideally situated just four miles from Morecambe Golf Club and just a short drive to Silverdale Golf Club. 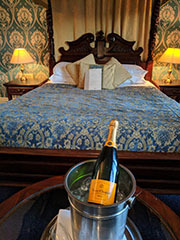 With 55 guest rooms, each one en-suite, and a fully experienced management team you are sure to relax and enjoy your stay. 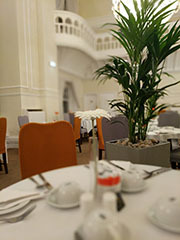 The hotel has its own restaurant with a beautiful minstrels' gallery and large floor to ceiling stained glass windows. There is a bar where you can relax with a glass of your favorite wine and watch the world below go by. The rooms all have the usual facilities to ensure your stay is enjoyable including full tea and coffee making facilities. There is Free WiFi in rooms and public areas. For the ultimate dining experience visit our restaurant. The very best Lancashire breakfast in town. Beautiful Afternoon Teas to remember. Dinner is served daily in our beautiful Ballroom style restaurant. Why not join us for an evening meal or a family gathering in our newly refurbished restaurant where you can dine on our freshly prepared and locally sourced produce and relax in our refurbished bar and enjoy a relaxing drink. The hotel hosts events for a wide range of clients including corporate/business, and leisure travellers from both the UK and abroad and visitors to the nearby university. With its large, airy conference rooms, high ceilings and expansive windows offering plenty of natural light, the hotel is perfect for anything from team building events to small executive meetings or private meetings. Our function rooms vary in capacity from 2 to 200 people making us the ideal choice for your event. All rooms have natural day light and Wi-Fi. Whether you are celebrating a signifcant birthday, anniversary or a special event, our team are here to assist. An extensive range of food and beverages are available to meet your requirements.